Card Text During their “draw cards” step, each player refills their hand to 1 additional card. Does The Howling Pit’s ability affect just me, or both players? Both players. The card text specifies that “each player” is affected. Therefore, both players will refill their hand to 1 additional card during their “Draw cards” step. If there is more than one Howling Pit in play, do the effects stack? Yes. For each Howling Pit in play, you refill your hand to 1 additional card. Therefore, if there were 2 Howling Pits in play, both players would refill their hand to 2 additional cards during their “Draw cards” step. At the end of my turn, I have 1 chain and 6 cards in hand. If a Howling Pit in play during my “Draw cards” step, do I lose the chain? Yes. Chains are removed when a player would draw at least one card during their “Draw cards” step and one or more chains prevent them from doing so. 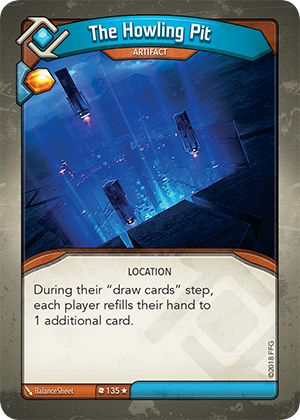 Because of The Howling Pit’s effect, you would be allowed to draw a seventh card during your “Draw cards” step. However, the chain would prevent you from drawing a seventh card and the chain would be removed.